Blue Raster, Sanametrix, and the National Center for Education Statistics (NCES) announce the release the School & District Navigator. Working with the Common Core of Data (CCD), a program that annually collects data about all public schools and districts, the most up-to-date information and maps are now available via the new mapping tool. The School & District Navigator displays a comprehensive selection of public schools and school districts across America, even specialized types such as public charter and special-education schools. Each school and district in the map comes with useful details and characteristics such as enrolled students, student/teacher ratio, grade span, and free and reduced lunch eligible enrolled students. Search parameters can be customized through the use of filters, which have been selected for the most common indicators. Narrowed results can be shared through Facebook or Twitter, or downloaded in an excel spreadsheet. 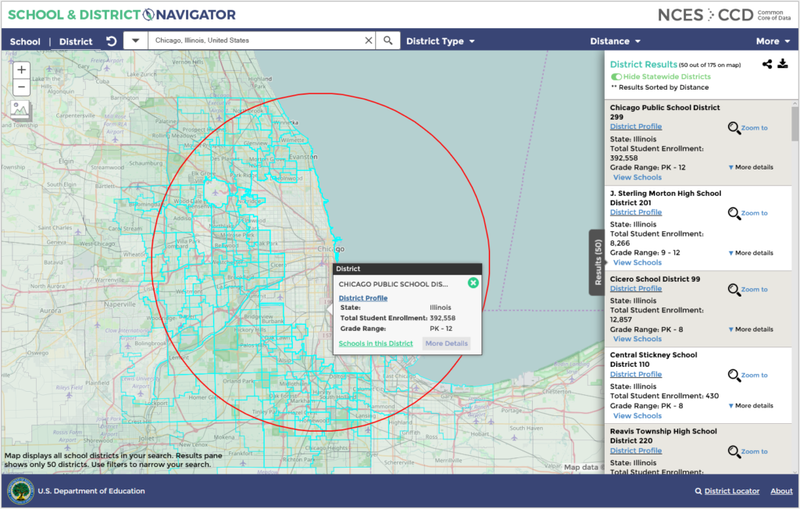 The map application enhances the capabilities of the existing CCD tools, Search for Public Schools and Search for Public School Districts, which enable the public to find essential information about public schools and districts, but lack geographic visualization. The School & District Navigator integrates with the original school search and district search engines by providing a link to each school or district’s profile within the search result details.